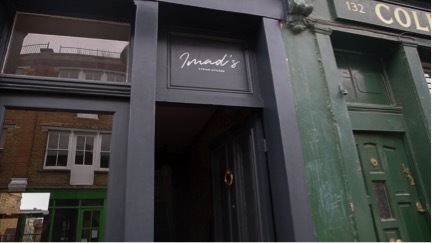 Syrian chef, now London-based refugee, Imad Alarnab, just launched a two-week pop-up and he’s already sold-out. In a small kitchen with creaky wooden floors, Imad chops thin strips of lettuce to perfection while he tells me about the past two years for him and his family. The kitchen opens up to a cosy dining area with two long tables and windows that look down onto London’s trendy Columbia Road. He’s been a car salesman since he arrived in London in 2015, but in Damascus he was a successful restaurateur. His two restaurants and several juice bars and cafes were all destroyed in Syria’s now six-year long civil war. Imad is soft-spoken and quick to smile. He speaks slowly and deliberately about the hardest year of his life, and yet, he is visibly at ease as he multitasks around the kitchen. Members of a volunteer group called UNICEF NextGeneration, which supports refugee families in London, met Imad through one of their campaigns and wanted to help him get back to doing what he loves: cooking. They partnered with the catering company, The Hampstead Kitchen, and Appear Here, a company that finds temporary spaces in London. The idea became a reality in a matter of weeks, and before the end of his first weekend serving home-style Syrian meals, the full two weeks have already sold out.